If you cycle in London, you’ve almost certainly seen these yellow stickers over the last few months. They’re on the back of most buses, many vans, and a few HGVs. “Cyclists stay back – I get priority as I pay road tax / am bigger / faster / more important than you“? “Cyclists stay back – I can’t be bothered to check my mirrors before turning, stopping or pulling out, so if I run into you it’s your fault“? This entry was posted in "Road Safety", Conspicuity, Cycling, HGVs on December 18, 2013 by rdrf. Below is a graph by Chris Gilham looking at cycling (those of all ages over 5) in New Zealand. 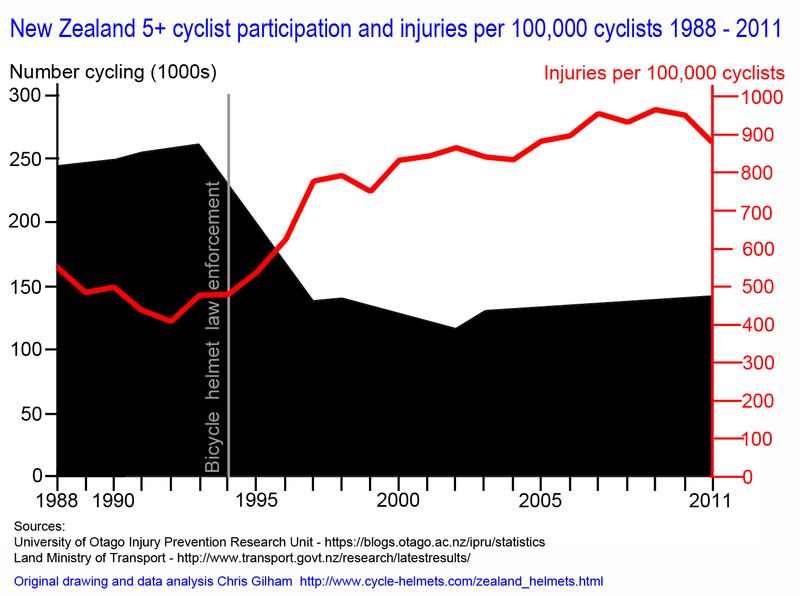 Look at levels of cycling and the cyclist injury rate following the introduction of the mandatory cycle helmet law. More to come on the analysis of this graph in the next post. This entry was posted in Cycle helmets, Cycling on December 17, 2013 by rdrf.